An agreement between Russia and a handful of OPEC countries to freeze oil production pretty much dominated most of the news out of the oil patch this past week. Record Oil and Gasoline Inventory; Gas Use Down...& a Russian-OPEC Cartel? Read more about Record Oil and Gasoline Inventory; Gas Use Down...& a Russian-OPEC Cartel? Nowadays the energy picture is confusing at best as the more information we are shown the more blurred our vision seems to become. Mixed messages, poor reporting and a media hungry to sensationalize anything it thinks can grab a headline have led to many wondering what the true energy situation is. We hear numerous reports on how the shale revolution will transform the energy sector, why alternatives are just around the corner, why advances in oilfield extraction techniques and new finds will help to lower oil prices. Yet no sooner have we read these rosy reports than we are bombarded with negative news on the Middle East, on why alternatives will never compete, on peak oil and declining oil production. So where do we really stand? Is our energy future one of falling prices and plentiful supply or should we prepare for declining supply and sky high prices? 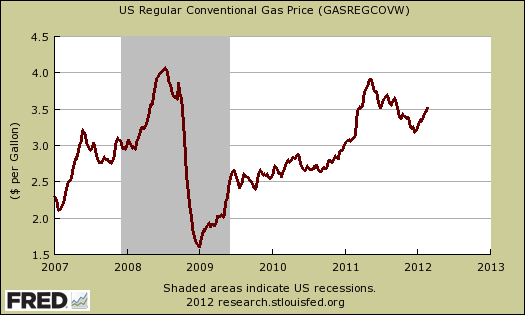 How much are you paying to fuel Wall Street oil speculators? A new, very timely St. Louis Federal Reserve research paper, Speculation in the Oil Market finds 15% of oil price increases are due to speculation and is the second most powerful mover of prices beyond actual physical demand. 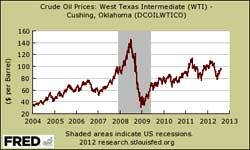 Demand itself accounts for 40% of the total oil price increase. Sorry speculative traders in commodities, the Fed actually did a just say no on more quantitative easing. The FOMC meeting minutes for January 24-25th were released last week and some speculative commodities traders still seem to be in denial land. The Committee also stated that it is prepared to adjust the size and composition of its securities holdings as appropriate to promote a stronger economic recovery in a context of price stability. A few members observed that, in their judgment, current and prospective economic conditions--including elevated unemployment and inflation at or below the Committee's objective--could warrant the initiation of additional securities purchases before long. Other members indicated that such policy action could become necessary if the economy lost momentum or if inflation seemed likely to remain below its mandate-consistent rate of 2 percent over the medium run. In contrast, one member judged that maintaining the current degree of policy accommodation beyond the near term would likely be inappropriate; that member anticipated that a preemptive tightening of monetary policy would be necessary before the end of 2014 to keep inflation close to 2 percent. A new year, a new day and a flurry of economic and financial predictions. Who are we to buck the trend? Yet, buck the trend we shall. While many news articles claim jobs will appear in 2012 and the economy is on the mend, uh, we don't think so. What we have is America stuck in a Labrea tar pit of bad policy and a never ending middle class head shrink. Think the iPhone is made in America? Like most things these days, manufacturing is offshore outsourced to China. Out comes another report on the terrible working conditions at the iPhone/iPad factory.